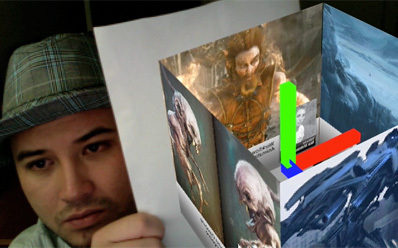 My second project using the FLARToolkit for Augmented Reality. Create an interactive promotional website for Gnomon Master Classes. I wanted to create and engaging and unique promotional piece for the Master Classes that incorporated several of Gnomon's promotional assets. I was able to use the banner, promotional video, and stills of the classes. Creating the process and workflow was exciting and challenging. First I created the intro animation in Maya and Cinema4D and then exported it out in Collada (.dae) format.The main chunk of the work was done in Flex using the FLARtoolkit Papervision3D engines. Creating the lights (you can see that the collada model shaders are interacting with the light while you move the paper!! ), shaders, and additional animation. I also was able to integrate the RSS feed for the Viewpoints and access not only the video but also the XML elements and metadata. I still have to optimize it for better framerates and work on using baked textures with the 3D model, but I thought you might get a kick out of it. Something about moving things in reality that really aren't there, is pretty cool in my book. Experimentation is not reserved just for College.